Home › Sociology › gender & feminism › Reminder: Submit Posts for the Down Under Feminists Carnival! 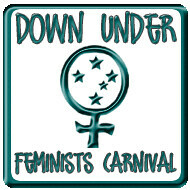 Reminder: Submit Posts for the Down Under Feminists Carnival! Submissions for the Inaugural Down Under Feminists Carnival are rolling in nicely! There are only three days left in the month – two and a half, in some timezones – so get submitting. You can find the carnival information page just by clicking the sidebar button, and I encourage you to use the sidebar button and link at your blog to support the carnival. Anything feminist posted in May from an Australian or New Zealander blogger is fair game. I’m happy to consider posts that aren’t strictly bloggy; I’ve included one feminist conference announcement, for example, but ordinary mainstream media news is perhaps not the most inspiring submission. Blog about it though, with your own interpretation, and it’s great. From the first of the month onwards, you can start submitting the June posts. June’s carnival is being hosted at In A Strange Land. However, the submission process remains the same – go to the Blogcarnival form. I hope you’ll all find some new reading and make some new blog connections through this carnival. Onward!